Some mornings call for nothing less than a biscuit, loads of butter and homemade jam. I believe I have just the jam for such an occasion. This jam was inspired by the rustic jams I buy for John and me to use on toast, sandwiches, and such. I’ve wanted to make homemade jam for a while but was always intimidated by the process. Some require fancy jarring equipment – perhaps an investment I’ll make in the future – others pectin, and I just wanted something simple, as usual. The ingredients list is modest and affordable, and there’s only 1 bowl (or pot, in this case) required. And though it’s a bit more time intensive at about an hour, it’s well worth the effort. The result is a refreshingly light, “springy” jam that’s perfect for warmer weather and all of the delicious food it brings with it. I’ve already slathered mine on waffles, fresh baked bread and on top of cream cheese toast – the latter being my absolute favorite. Somehow the tanginess of the cream cheese pairs perfectly with the sweetness of the jam. I think I’m in love. Of course, if you’re not an orange person, simply sub another fruit. Strawberries, persimmons, blueberries, blackberries, and apricots would work lovely here and perform similarly as far as preparation and consistency. I have a feeling I’ll be making a lot more homemade jams come summer. I simply can.not.wait. 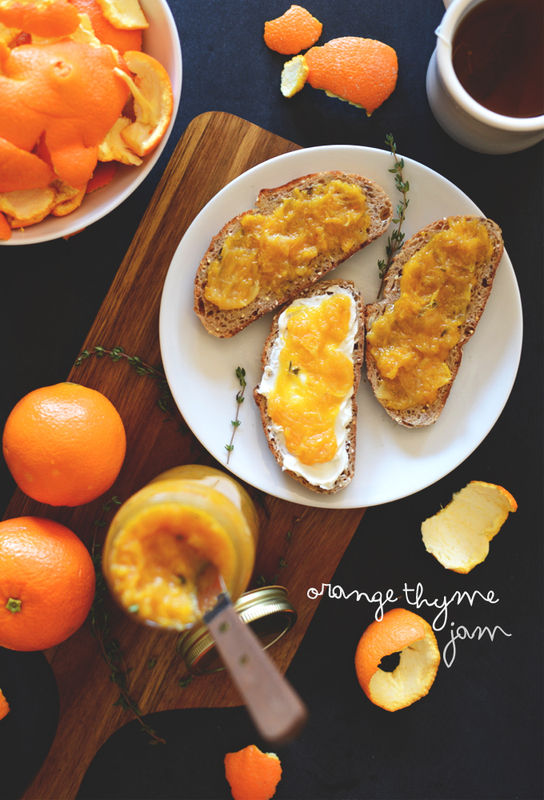 A simple, springtime jam with fresh oranges and thyme. The result is a luscious, not-too-sweet jam perfect for waffles, toast, pastries and buttery biscuits. Just 7 ingredients and 1 bowl required. Bring oranges, orange juice, lemon juice and sugar to a low boil in a large saucepan over medium to medium-high heat, stirring frequently to combine. Once it reaches a low boil, reduce heat to medium low and add a pinch of salt and stir. Simmer for about 30 minutes and then add thyme and orange zest. Continue cooking until the mixture is reduced by about a third. It should be thick and syrupy - be patient as the whole process may take up to an hour. Add a bit more sugar to help it thicken even more. Once thickened, remove from heat and let cool. Transfer to clean jars and store in the fridge. Will keep for a couple of weeks. 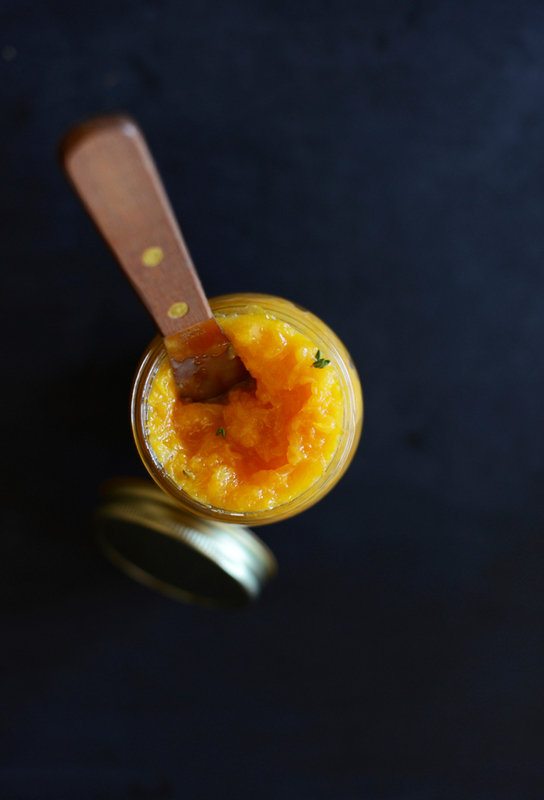 To store in freezer, make sure to use freezer-safe canning jars to avoid cracking. *Recipe (as originally written) yields ~4 cups total. Question from me is … do you have to take off the outside of each wedge of orange? 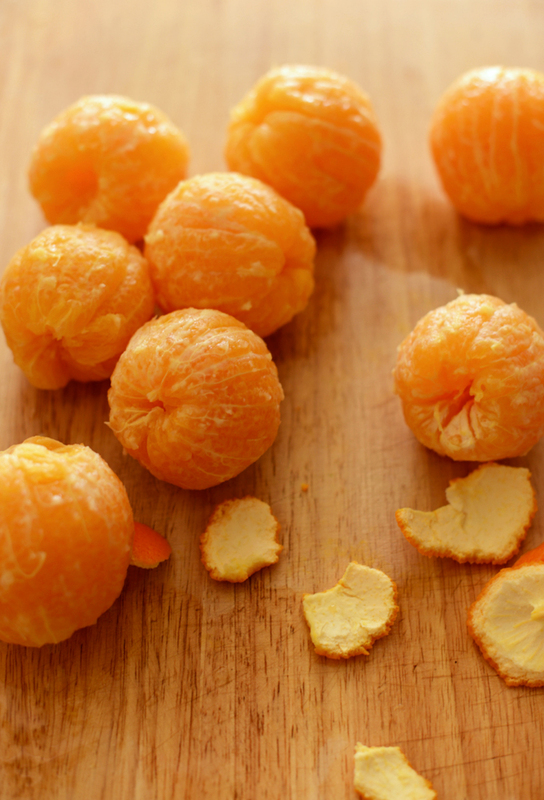 Or, is the outside between each orange piece left on? Hi Barb, no need to remove the outside of the wedges. It is more of a textured jam, rather than a smooth marmelade. Hope that helps! Hi there I’m excited to try making this jam! One question though; can this recipe be water bath canned? We haven’t tried and can’t say for sure. If you experiment with it, report back on how it goes though! Did you use any books inmaking this or is it your own?if there is what book is it? No, it wasn’t but it was inspired by the rustic jams we buy and use on toast, sandwiches, and such. Hi, I live in Valencia,Spain, I am British, in a couple of months there will be an orange glut here, Price about 10kilo for a euro. Problem is I cannot stand marmalade because of the bitter taste, is this jam similar or just like an orangy jam? Hi Linda! It’s more of an orangy jam! Can you put this jam in the freezer to save? Yes! Just ensure you use freeze-friendly canning jars to ensure they don’t crack! so easy. My family and friends loved it.. Thank you will have to check out your other recipes! Simple and delicious! 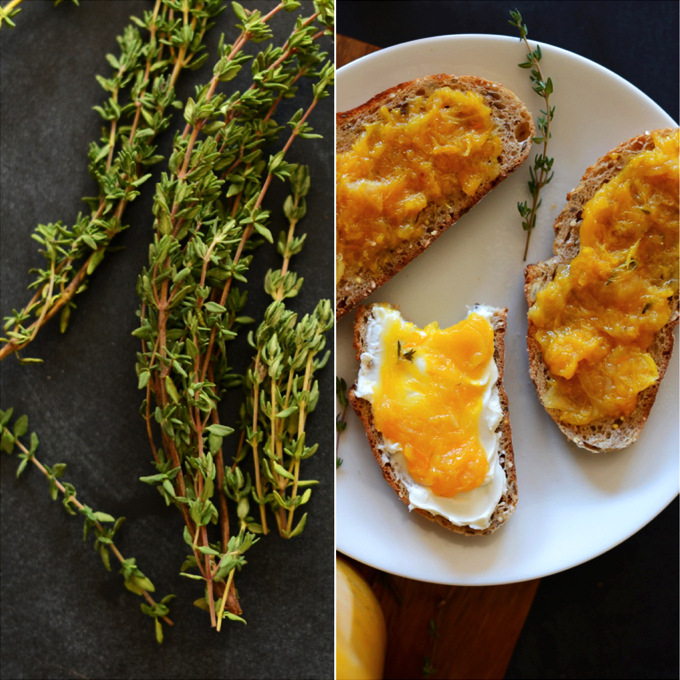 I didn’t have enough oranges so I made this with the big $5 bag of Persimmons I had just picked up at the farmers and some rosemary as sub for thyme. Really yummy and filling, been loving it on toast in the morning or as a before dinner snack ? Back in May 2016 while Rving with my family through the west coast we were given a whole crate of oranges, I absolutely love oranges but Jezz, it was a lot oranges… I baked orange cakes, orange cookies, orange juice and smoothies and i still had plenty left. So i did a google search and found this recipe. It’s not easy to cook on a small camper kitchen, with no counter space but I really wanted to give this a go. The whole family fell in love with this recipe. Since then I’ve made this jam so many times I lost count. I am super addicted to it :) and always have to have a jar of it in the refrigerator. Thank you Dana, for this delicious Orange jam. Your printer friendly link doesn’t work, at least on my iMac. Will have to try recipe from my phone. It looks delicious and simple. This looks and sounds lovely! I’m wondering if you could use date sugar instead of cane sugar… Thoughts? My mom and I made this and it was fabulous! My husband and mom LOVED it and they got upset when I gave some to our neighbor. They said it was too good to share! Pairs great with your vegan biscuits. Ha! So great! Glad you all enjoyed it! 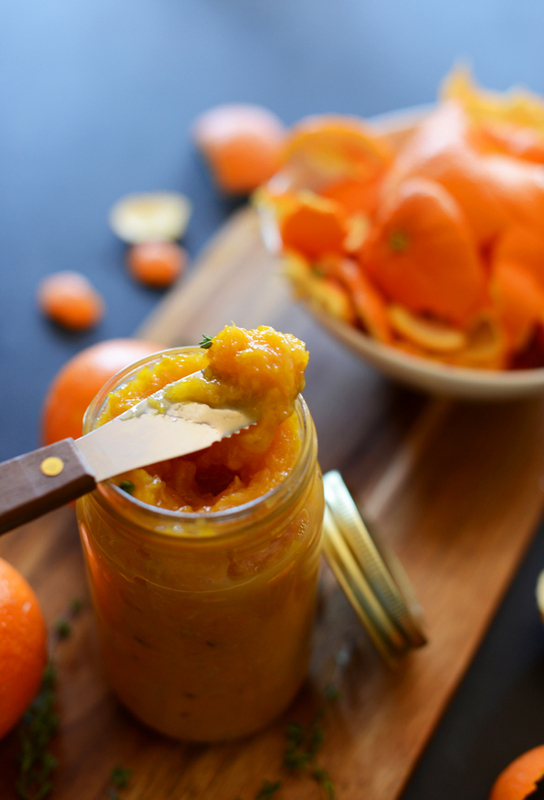 I’m about to make my 4th batch of this jam from oranges I picked off my one tree in February (it’s May 3 — both my oranges and lemons have no problem staying good in the frig). Thi s is a wonderful recipe (and I make a lot of fresh jams), thank you. 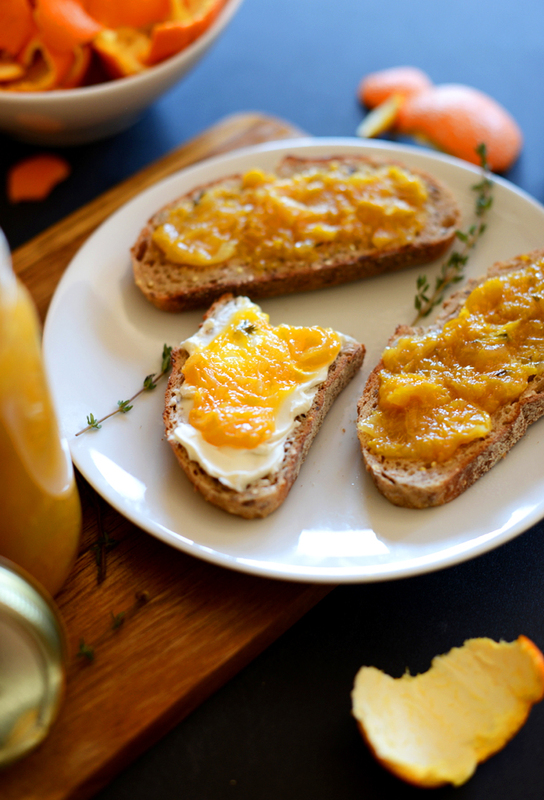 I’d like to encourage your readers to not hesitate to make this with even 3-4 oranges. You’ll get one jar and it lasts a long time in the refrigerator. I also freeze my jams and have fresh jam throughout the year. 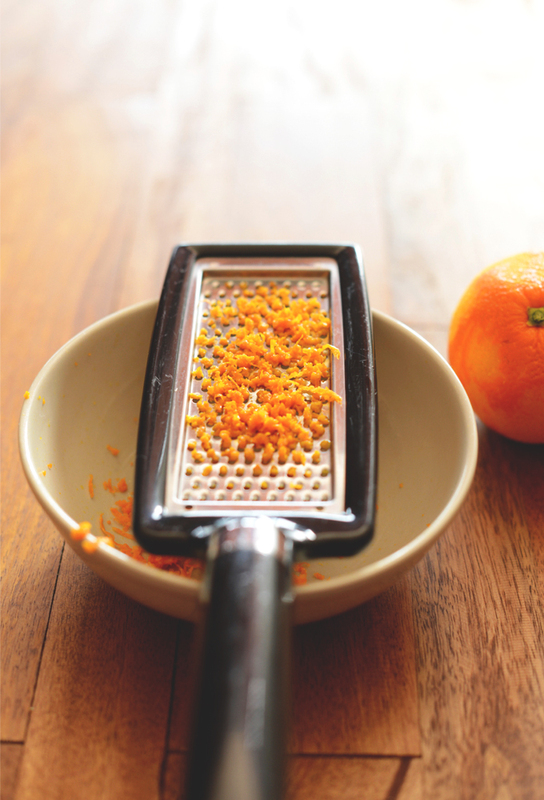 I take the peels and make candied orange peel. Putting a little ginger in the syrup is tasty, too. And to be sure nothing goes to waste, I put the leftover syrup from the candied peels in a jar and we use it in seltzer, ice cream, and on french toast. Thanks for the tips, Jeanie! I am making this right now, and my house smells heavenly. Thanks for this recipe. Dana, this looks amazing!! I am wondering if it’s possible to can this for any period of time? I would love to do that so I have this 6 months from now. Photo’s are beautiful. This jam is super gorgeous! This is a must for me. I never know what to do with excess oranges off tree. Do you use lemon thyme or common thyme. I love the idea or orange jam. I have to agree with you that I particulary love jam on cream cheese toast (or even a waffle). My kind of breakfast!! If this is asking for too much information, not a problem in not responding. But…where do you two amazing souls live? And do you have a more private way (email?) of communicating? As a 71yo leadership mentor, I encourage people to “tune in” to your blog. A mentoring model I’ve developed over the years (not a system or formula) is concerned with helping people think about their lives in 8 dimensions. All of these impact the other. Where I know people are struggling with health/wellness, etc., I encourage them to begin eating better, and moving more, etc., and your blog posts have been an enormous encouragement. Thus, I would welcome, if/when you and I may have the time to have further dialogue about the best of food for nourishing not only one’s body, but one’s soul and relationships and dreams. Would you, in the future, be able to give any time to that? Living in two different parts of the planet, most likely, Skyping is a great way to communicate. Just today I’ve Skyped across town (live in the Denver area, and a massive Spring snow storm is under way), and when I finish this I will be “going” to Dubai. :-) Would welcome exploring what might work. Keep up your good work. An olde man here in the Rockies is thoroughly enjoying your efforts. And your pictures are art pieces! …thank you for any consideration! 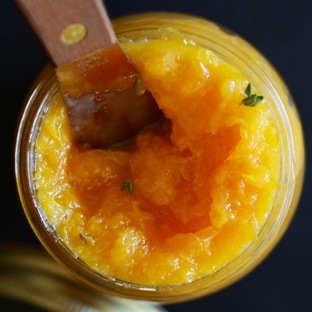 Can this orange/thyme jam be further preserved (for longer period of time) by placing in boiling water bath? Can the persimmon version also be preserved (canned) using boiling water bath? I have a lot of persimmons! 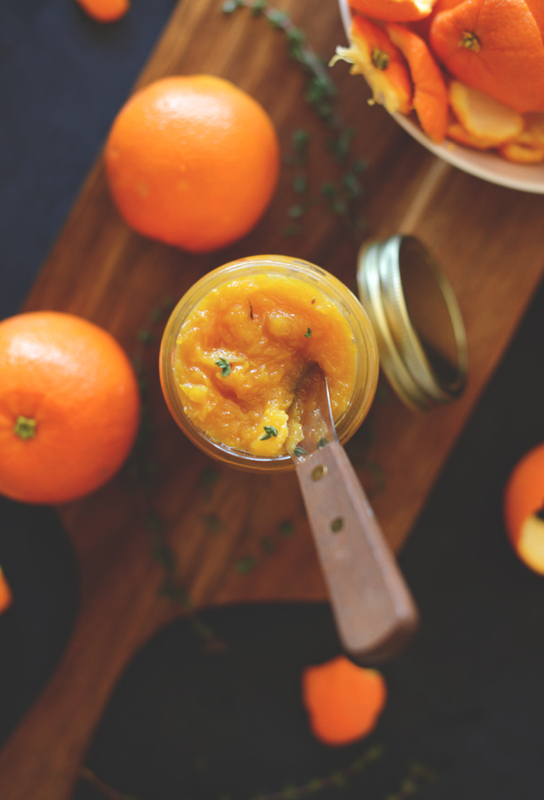 I haven’t tried that (neither persimmon jam OR canning), but good luck, should you attempt it! This looks amazing. I love the photographs. Stunning! Love how bright and sunny these pictures are! 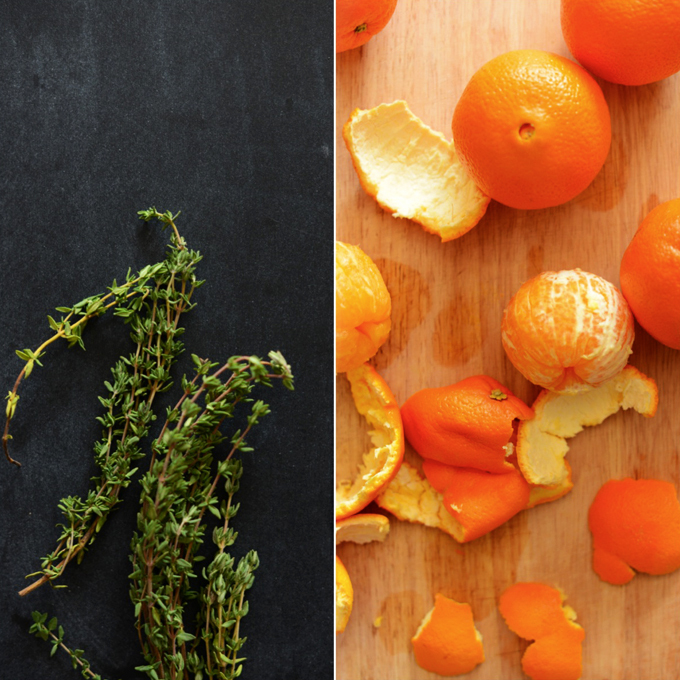 Thyme is such a great herb especially in combination with citrus fruit. Lovely! What a great combination of flavors, Dana. Homemade jam is one of my favorite things. Stunning pictures, as always! Looks delicious, I love the taste of homemade jam. Oh, this looks heavenly! I have never made home made jam but now I must try. Thanks for sharing! Prettiest jam I’ve ever seen! I have been looking for this jam recipe for a few days, you read my mind, thank you! Making you own jam is such and awesome idea!! This orange jame look so good on that toast! I want some for breakfast!